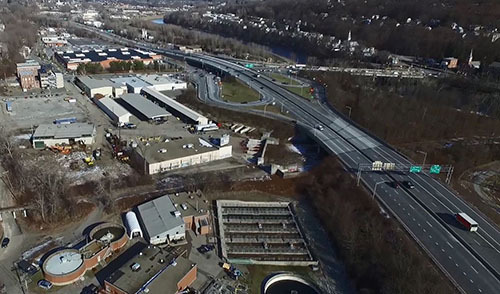 The Route 8 Expressway is the primary commuter route and provides a more direct connection for those traveling to Bridgeport and lower Fairfield County from the greater Waterbury area. The highway was established in the early 1920’s as a state route extending from the town of Stratford to the Massachusetts state line. Portions of the expressway were rebuilt and converted into a limited access facility beginning in the early 1950’s. Most of the sections Route 8 through the lower Naugatuck Valley region were upgraded to an expressway by 1962. A major completion of the Route 8 Expressway occurred in the mid-1970’s that extended the highway from Interstate 95 in Bridgeport into and through most of Trumbull. All sections were finally upgraded in 1983, including the construction of a major interchange with the Merritt Parkway and four-lane expressway through Naugatuck State Forest area between Beacon Falls and Naugatuck. Because most sections were built prior to the establishment of interstate/expressway design standards, several interchange areas and mainline sections are considered functionally substandard, featuring short on- and off-ramps and non-full directional connections. These substandard interchanges are primarily located within the city centers of Shelton, Derby, Ansonia, Seymour and Naugatuck. Substantial upgrades have been made to Route 8 over the years to address deficiencies. The Commodore Hull Bridge over the Housatonic River was rehabilitated and widened to provide auxiliary lanes to connect Route 34 in Derby with Route 110 in Shelton. In addition, the Route 8 and Route 34 interchange was reconfigured and auxiliary lanes were added to the north. Plans are also underway to rebuild several interchange areas to improve access and make connections with local streets safer. However, these actions are considered long term and are not currently on the state’s 5-year capital improvement plan. Today, Route 8 is the major commuter option with daily traffic volumes typically in the 51,000-to-75,000 vehicles per day (vpd) range south of the Commodore Hull Bridge and between 45,000 and 55,000 vpd day north of Derby. The highest volumes are recorded at the Commodore Hull Bridge. About 83,700 vehicles cross the bridge between Derby and Shelton each day. 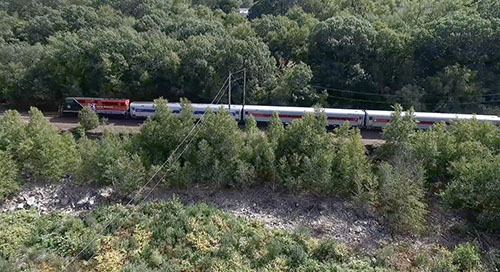 The Metro-North Railroad operates commuter rail service in Connecticut between New Haven and Grand Central Terminal along the main line. Three branch lines feed into the New Haven main line. The Waterbury Branch Line (WBL) is one of the branch lines and extends from the city of Waterbury to its connection with the main line at the Devon wye. The WBL is the longest of the three branch lines at about 27 miles. Service is operated between Waterbury and Bridgeport, with stops at Naugatuck, Beacon Falls, Seymour, Ansonia, and Derby-Shelton. The WBL consists of an unsignalized, non-electrified single track with no passing sidings. Because of the lack of signals, the WBL is considered “dark” territory. These physical characteristics limit and constrain the level of service provided on the line as northbound and southbound trains are unable to pass one another, and, since the WBL is “dark” multiple trains and cannot operate simultaneously on the line. To upgrade the line, the state has initiated the design of a full Central Traffic Control signal system and committed funds to implement the system in conjunction with installing Positive Train Control. In addition, two sections of by-pass sidings are programmed for construction with the one near Derby under construction. The sidings will be fully integrated into the signal system to allow trains to enter and exit the sidings seamlessly. These projects will permit more frequent service and allow trains to operate on the line simultaneously in opposite directions. Rail service, while limited and constrained by the physical and operating characteristics of the Waterbury Branch Line, could capture a significant portion of the vehicular commuter traffic currently using the Route 8 expressway with strategic infrastructure improvements coupled with and transit-oriented development. The shift from auto-dependent travel will mitigate congestion, improve safety and reduce the emission of greenhouse gases. In addition, the establishment of an alternate commuter transit mode along this corridor which would provide a fast, frequent and convenient connection between the Bridgeport rail station and the Derby-Shelton station could result in avoiding a future multi-billion dollar investment, of limited transportation improvement funds, for the replacement of the Commodore Hull Bridge and re-allocate those funds for more beneficial and sustainable transportation uses. Local, fixed-route bus services within the Naugatuck Valley planning region are also limited and somewhat fragmented. 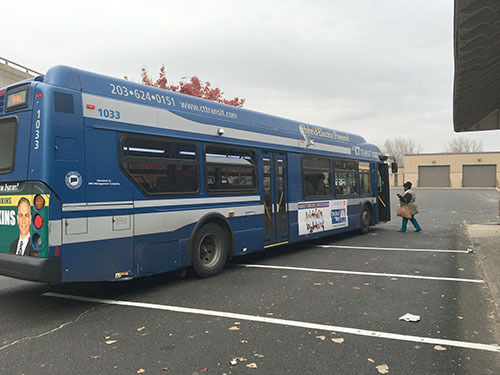 The Greater Bridgeport Transit Authority (GBT) operates three bus routes into the lower Valley with connections and turn-arounds at the Derby-Shelton rail station. The New Haven Division of CT Transit operates one route from downtown New Haven to the town center of Seymour via Route 34, with intermediate stops at the Derby-Shelton rail station and downtown Ansonia and Waterbury Division operates several commuter “tripper” routes to Naugatuck and Beacon Falls. The Valley Transit District provides specialized, “dial-a-ride” service to residents of the region, with rides needing to be reserved in advanced.